The use of digital/reality capture information from drone technology continues to increase in the UK and Irish construction industries, with 52% of respondents to a new survey now using the technology compared with 33% in 2017. This increase has been revealed in a poll by aerial mapping, inspection and surveying specialist ProDroneWorx. However, more advanced digital/reality capture outputs continue to be underutilised, the survey found. ProDroneWorx asked senior figures within the construction, infrastructure and asset inspection markets about their perception, usage and understanding of the digital/reality capture outputs from drone technology. A total of 150 respondents took part across the UK and Ireland. According to the survey, the top three reasons for adopting the technology are improved data quality (56%), time saving (54%) and the reduction of risk (42%). Interestingly, fewer companies than last year are planning on utilising drone technology in-house, reflecting, perhaps the level of knowledge and expertise needed to deploy them. However, the findings also demonstrate that drone technology is currently being underutilised. 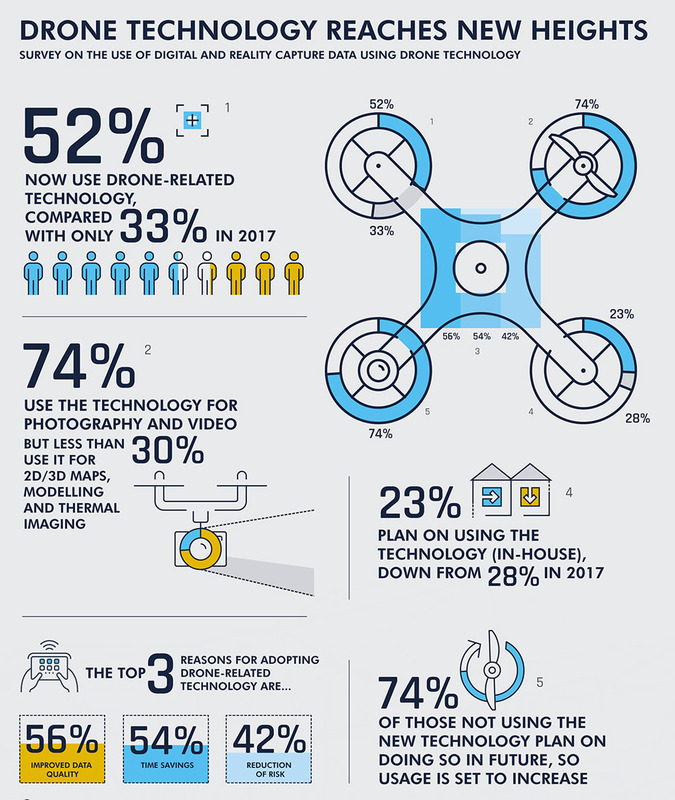 While 74% of respondents are using drone technology for photography and video, fewer than 30% of respondents are using the technology for value-added services such as aerial LiDAR, 3D point clouds, 3D modelling, digital surface/terrain models, orthophotos and thermal imaging. Ian Tansey, managing director at ProDroneWorx, said: “In a world of very tight margins of about 2% in construction, and an increasingly competitive landscape, the use of digital/reality capture data gives firms a significant competitive advantage over their peers through improved data quality, reduced costs, increased productivity gains and the mitigation of risk”. Tansey says that digital/reality capture data outputs created from drone technology using photogrammetry and LiDAR are starting to transform traditional business models, helping to reshape the construction, infrastructure and asset inspection markets. This is happening through the improved management of assets digitally, deeper data insights, better collaboration on projects, improved data deliverables to clients, cost reductions and the reduction of risk. 74% of those not using the technology plan on using it in future, so usage should continue to increase. Only a small proportion (15%) of firms have no plans to use the technology in the future. 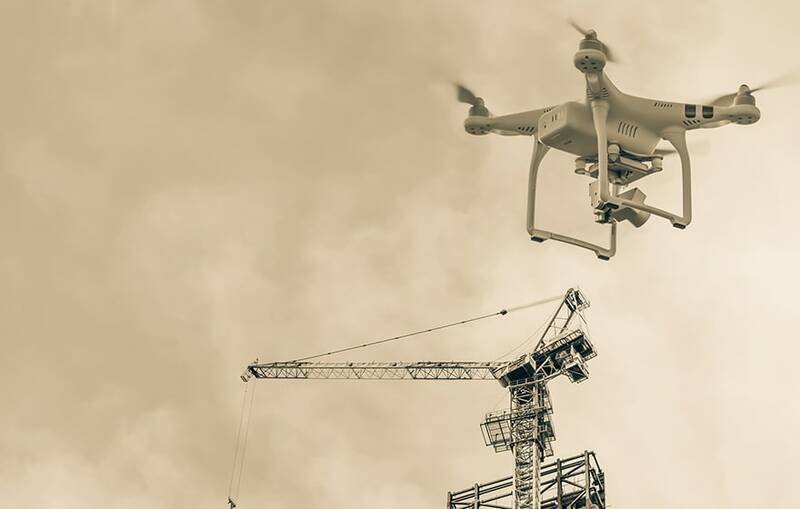 Construction firms have two options when it comes to deciding how to incorporate drone technology into their business models and workflow: creating an internal drone unit/function; or using a third party specialist. The vast majority of firms plan on outsourcing the business to third party companies; only 23% of companies plan on using the technology themselves (in-house), down from 28% in 2017. The majority of respondents (78%) were from England, followed by the Republic of Ireland at 11%; a smaller number were from Scotland (7%) and Wales (3%). 26% of respondents were from Construction, 17% Architecture, 17% Civil Engineering, 9% Building Surveying, 7% Surveying and 23% in other sectors. Drones are slowly penetrating the construction industry. Good to see adoption at 52%, albeit primarlily for video and photography. Among the market leaders we are seeing more of the innovative applications. 3D Models, LIDAR and DTMs becoming more common as the drone output is found to be much cheaper to acquire, accurate and repeatable.